A few weeks ago someone sent me a link to an article, on Outside magazine’s website, called “The Ten Worst Ways to Die in the Wild.” I read it so you don’t have to; trust me, you aren’t going to miss anything. I’m not sure what the point of the article was (beyond getting you to click on the link). It certainly didn’t provide any practical advice to avoid coming to your demise while outdoors, other than staying-the-heck-away from blue-ringed octopuses. It got me to thinking, though, about what the real dangers are on a thru-hike of the John Muir Trail. The more I thought about it, the more it came down to one word: water! Water, Part 1. If you are properly equipped, there is no reason you should be cold and wet during your hike, even if you are confronted with a rainstorm. If you are cold and wet, you’re half way to hypothermia. If you’ve gotten your down sleeping bag wet, you’re 90% of the way to hypothermia. If you are wet, cold, without an effective sleeping bag, and are unable to start a fire, you have a serious, life-threatening problem. Rain is no big deal on the hike, if you are prepared for it. Water, Part 2. Sure, you’re a good swimmer, in a warm pool, with a lifeguard, after a good night’s sleep, when you’re feeling strong. How about in water that was snow not long ago, by yourself, after hiking all day? I grew up on a lake and am an ex-surfer, but when I’m by myself on the trail, I wade—I don’t swim. Water, Part 3. So, you’re thinking that this stretch of trail is above treeline and there aren’t many large boulders to hide behind in the event you have to drain your bladder. How mortifying it would be for someone to round the corner and catch you while you are, er, engaged. Here’s an idea: just don’t drink much water! What could possibly go wrong? Lots, it turns out. Dehydration and heat stroke are both dangerous, and both can be prevented nearly 100% of the time if you drink regularly. Water, Part 4. If it’s raining, particularly in the late summer, it probably means that there is a thunderstorm in the area. Thunderstorms are accompanied by lightning. You do not want to be on the highest ground during a lightning storm. The best way to avoid that is to start early on the days you are going over passes. 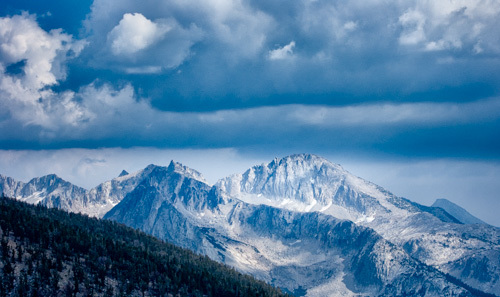 Thunderstorms in the Sierra Nevada tend to be early- to mid-afternoon events. For the vast majority of those who walk this trail, there aren’t any real dangers. Don’t get me wrong, I’m not saying you can’t get yourself hurt if you refuse to exercise good judgment, if you ignore serious situations, or if you are just plain unlucky, but that is true just about everywhere. The fact is that almost all JMT hikers survive their experience with nothing more than a blister or two and some sunburn. The dangers I list, above, are almost completely avoidable through good decision-making on your part. If you’re on the trail you are already living the adventure; there is no need to push the envelope any further. Be cautious, be safe, and come home with bragging rights. Thanks Ray, enjoyed your article. Nice photograph too. Thanks, Kelly! Later that day (the day of the photograph) I got rained on, to no surprise.